Jarl of Markarth in 4E 201. His father, Hrolfdir, was killed by the Forsworn. Prior to his death, Igmund's father and the Empire established a Nord militia that included Ulfric Stormcloak in order to re-secure control of Markarth, offering the militia the freedom to worship Talos in exchange for regaining control of Markarth from the Forsworn, a promise which could not be kept once the Thalmor objected. 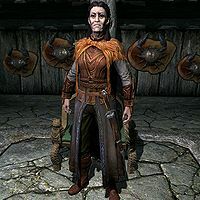 Igmund succeeded as Jarl of Markarth at a young age in 4E 176, following in his father's footsteps in siding with the Imperial Legion, and he continued the fight against the Forsworn for the next twenty-five years.